Over the last couple of weeks, and as a bit of a distraction from finishing off my PhD, I've been working with James Cheshire looking at the use of different languages within my aforementioned dataset of London tweets. One issue with this approach that I did note was the surprising popularity of Tagalog, a language of the Philippines, which initially was identified as the 7th most tweeted language. On further investigation, I found that many of these classifications included just uses of English terms such as 'hahahahaha', 'ahhhhhhh' and 'lololololol'. I don't know much about Tagalog but it sounds like a fun language. Nevertheless, Tagalog was excluded from our analysis. The tool works by scanning a chunk of text and then segmenting and analyzing four-character “tokens.” These tokens are compared against a very large table of reference tokens that have language properties associated with them. The source code that Manley used is said to be available here. But the cited python wrapper for C++ code in the source package does not seem to be present, and I couldn't get the C++ test program to compile, and don't have time this morning to figure out what's wrong. So I'll just note that in the Wikipedia article on the Tagalog language in Tagalog, the string "haha" occurs 8 times, and the string "ahah" occurs 4 times; but none of "ahhh", "hhhh", "lolo", "olol" occur at all. I'll be grateful to any reader who takes the time to figure out how to get the stand-alone version of the "chromium-compact-language-detector" to compile and run in a standard linux environment. A more detailed overview of the algorithm would be nice as well. Apparently it works from a list of UTF-8 4-grams that are considered to be diagnostic of language identity — and this table is "compact" in the sense that it's much smaller than a full 4-gram language model for each language would be — but it's not clear to me how the table was created, or exactly how it's used in the program. The string "olol" doesn't occur at all. Again, some enlightenment as to where this table came from and how it's used would be enlightening. 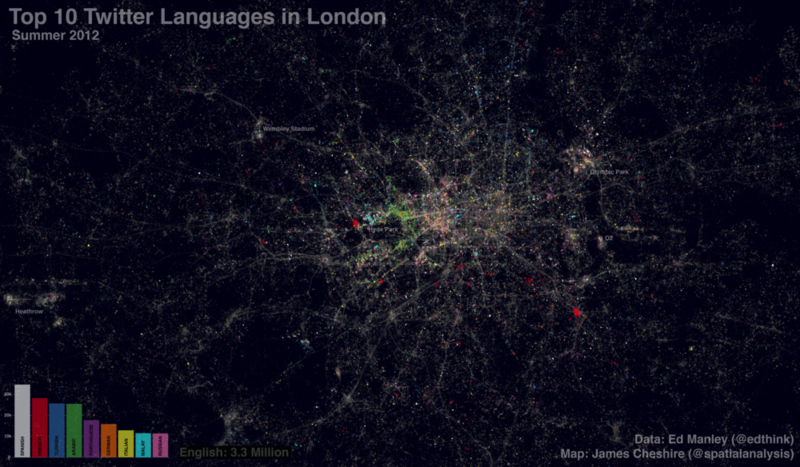 A nice zoomable version of the London language map can be found in "Mapped: Twitter Languages in London", SpatialAnalysis.co.uk 10/22/2012, and there's some media coverage in Shane Richmond, "Twitter map of London shows 66 languages", The Telegraph 10/26/2012. And then 'import cld' works. The LD_LIBRARY_PATH is a hack because cld.so depends on libcld.so.0, but for some reason, it isn't looking in /usr/local/lib for it. I didn't bother tracking down why. "The string "olol" doesn't occur at all. " Tagalog has recently been in the news in Canada, too. Though on a rather different statistical front; this upsurge in Tagalog use doesn't come from tweets, or n-grams, or text of any sort, but rather from demographic reports. Hello, we're probably fond of redundancy (as we normally do with names like Jun-Jun, Lot-Lot, Len-Len, Bon-Bon, and the list goes on). Of course, there's "lololololol" to note that the person happily writing (usually texting) it is laughing out loud—a lot. Could there be some issue with detecting the character encoding? Is it looking at e.g. UTF-16 2-grams? Anyway, should we desire to name this newly-discovered language, I nominate "hash-Tagalog". Native speaker, not a linguist, but I wonder if it could be because Tagalog uses repetition of the first syllable, along with prefixes, for aspect and tense. Also, "lolo" is a Filipino word for "grandpa". I say Filipino rather than Tagalog because this one was picked up from Spanish — though the Chrome language detector can't distinguish between the two. This probably isn't enough to influence the token frequency breakdown, at least not when compared to the various combinations of verbs starting with "lo". You can find a lot of the scoring details by exploring DoQuadScoreV3() in cldutil.cc. So if you look at the first table entry you've got up there, 0×6281082c goes with "lolo" without any prefix or suffix. Using QuadHashV25(), the 4-gram 'lolo' hashes to 6281, which is a key to the other half (the value) 082c. If you look that up in the other (16k) table, entry 082c is 0x21003a02 (which the comments say is eu.tl…_220). Other comments say it's a "4-byte entry of 3 language numbers and one probability subscript". The language numbers come from languages.cc, so 21 (dec 33) is Tagalog, 00 is UNKNOWN, and 03 is Dutch. The remaining "a02" indicates the probabilities for the 3 languages. The 'a' (10) byte goes with Tagalog, the 0 goes with unknown, and 2 goes with Dutch. The probabilities for each quadgram are added to the running total for those 3 languages so far. Most of the rest is pretty opaque to me, since I don't really have time to look at this in depth, but presumably at some point it takes the language with the top probability and presents that as the best guess. An excellent example of how domain mismatch causes problems for classifiers. I don't know whether this is an obvious point, but the frequency (and conditional probability) of "lolo" in Tagalog by itself doesn't matter much. It's the frequency of "lolo" in Tagalog compared to other languages (roughly, the posterior probability) that decides which language gets chosen. (I'm assuming a uniform prior.) If "lolo" occurs infrequently in Tagalog, but never in other languages, its presence could still form the clincher argument. I haven't looked at the code at all. But my hypothesis would be that instead of a generative model, this uses a discriminative model with strong regularisation. A generative model gives the probability of the character sequence given the language; a discriminative model directly gives the probability of the language given the character sequence. In this case, it would have the shape of an n-gram model, but the weights don't have to add up to 1. The regularisation would force uninformative weights to exactly 1 (say), hopefully without much loss in classification. The hash table would only contain the weights that are not 1, which repesent, roughly, the clincher arguments.